Darlington’s luck is certainly in, the nationwide franchise Kaspa’s has just opened its doors this evening for the first time! We couldn’t resist popping in and checking it out. 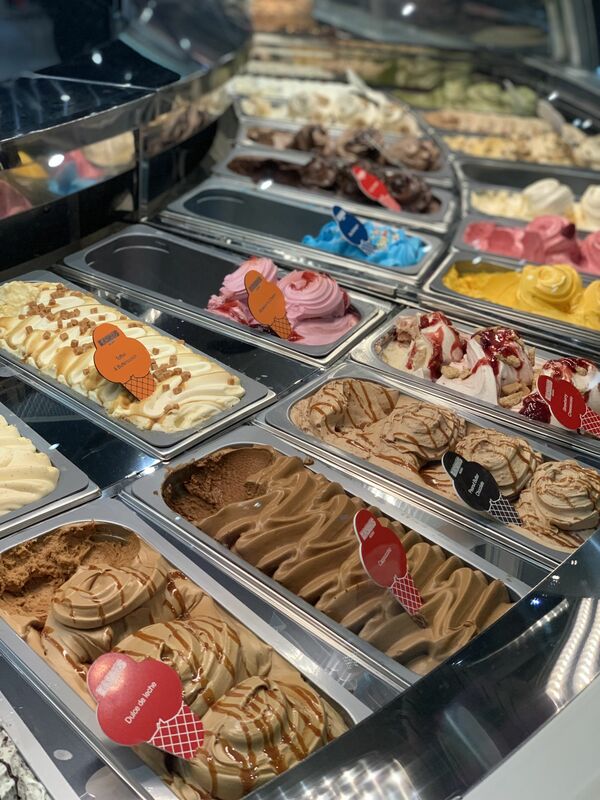 This exciting new dessert house offers the worlds favourite hot and cold desserts all under one roof. 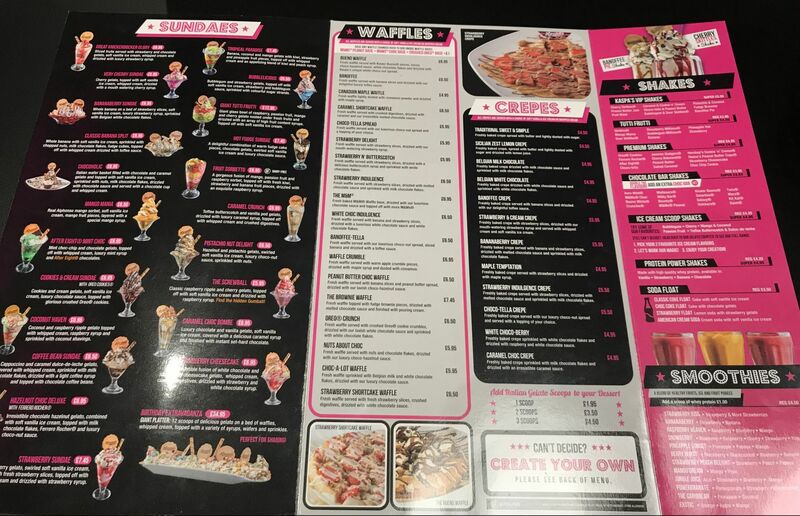 A menu that boasts a mouthwatering selection of ice creams, gelatos, waffles, crepes, milkshakes, smoothies and Sundaes. 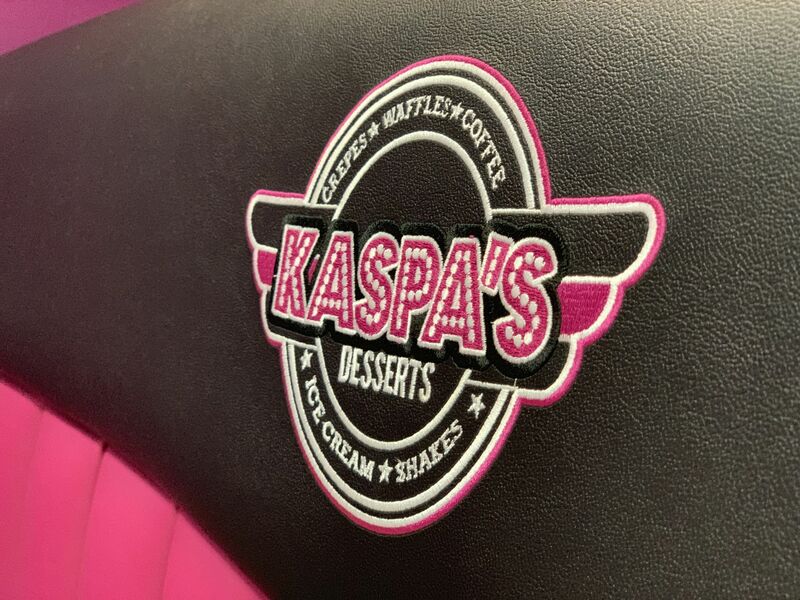 The duo Syed Shah and Raja Mirza, launched their first Kaspas venture in Claton Street, Newcastle, in 2014, two years later launching a second Kaspas in High Street West, Sunderland. Now they have opened the doors today in Darlington and it’s certainly third time lucky for the residents of Darlington. It’s clear from the outside alone this place looks the business. With its signage and decor really standing apart from the rest of Northgate on the dark winter evening. The seating is a mixture of booths and smaller tables, with stitched logos on all of the seating and glittery black wallpaper on certain areas alongside the bright lights and the whole places ooze’s with American diner style. We are seated in a booth and given our menus, there is so much choice. I noticed as well if you’re not wanting to indulge you could even choose a protein power shake from the menu! I’ve included a photo of the inside of the menu to give you an idea of prices. You can also find the full menu here. You then choose your order and go up to the main counter to place it and pay. At the main counter, you can see the enormous choice of mouthwatering ice creams and cakes on display. Below are a few photos. Our order came out really quite fast and looked scrumptious! They put a lot of attention to detail making your desserts and the waffles are huge. After visiting a few different places over the last 6 months which serve waffles, I must admit the one I had this evening was the best one yet! The right texture and made to perfection in my opinion. The flavours where so good on mine, I went for the Bueno waffle. You can see all out desserts below. We all thoroughly enjoyed our desserts and totally stuffed afterwards. None of us actually managed to finish and it’s wasn’t through lack of enjoyment they were just so good and filling!